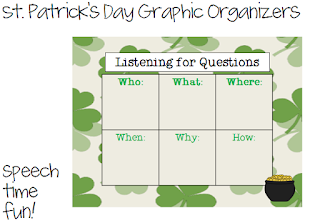 Speechie Freebies: St. Patrick's Day Graphic Organizers! Looking for more fun graphic organizers? How about with a St. Patrick's Day theme?! Check out how you can grab this 3-in-1 download! Check out my post and how you can grab this freebie HERE! We are not seeing the inappropriate comment on our end. Is it on Speech Time Fun's website? Will look into this. Feel free to e-mail us anytime (e-mail should be in the "About" section) or message us on Facebook! Thanks for the heads up!